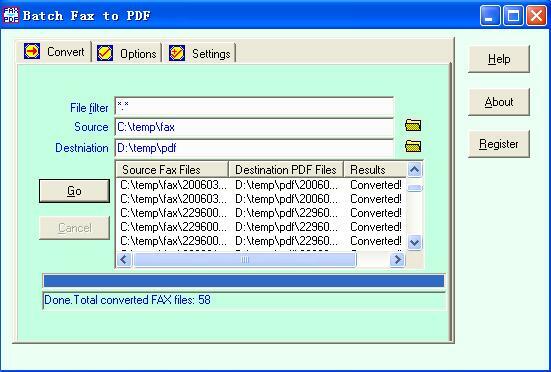 A fax to pdf converter which enables you to convert MS *.awd fax to pdf files, and convert RAW fax files like *.g3, *.g31d, *.g32d, *.g4, *.mh, *.mr, *.mmr, *.fax to pdf files. Batch Fax to PDF is a fax to pdf converter, enables you to convert WinFax fxd fxm fxr fxs, BitFax bfx, APRO, MightyFax apf, black-white dcx bmp fax, Faxwizard FMF, CALS Group IV (type I) cal mil ras img gp4, Microsoft awd, Zetafax g3f g3n, Image System ig4, Kofax Ascent Capture ds fax, Xerox Edmics-mmr ED, Quick Link qfx, black-white tif tiff of Modified Huffman, group 3, group 4, PackBits compressed and uncompressed tiff, raw fax like g3 g4 mh mr mmr fax files, and all other group 3, group 4 compressed fax files, etc, to pdf files in batches. Note: awd fax is supported on win2000/xp/2003 (not win9x/winMe) family, and you need download awd patch (it's free), run it to setup before you can convert awd fax to PDF with Batch Fax to PDF. Both GUI and command line modes No need of Adobe Acrobat. Batch Fax to PDF is a fax to pdf converter which enables you to convert MS *.awd fax to pdf files, and convert RAW fax files like *.g3, *.g31d, *.g32d, *.g4, *.mh, *.mr, *.mmr, *.fax to pdf files, and more.